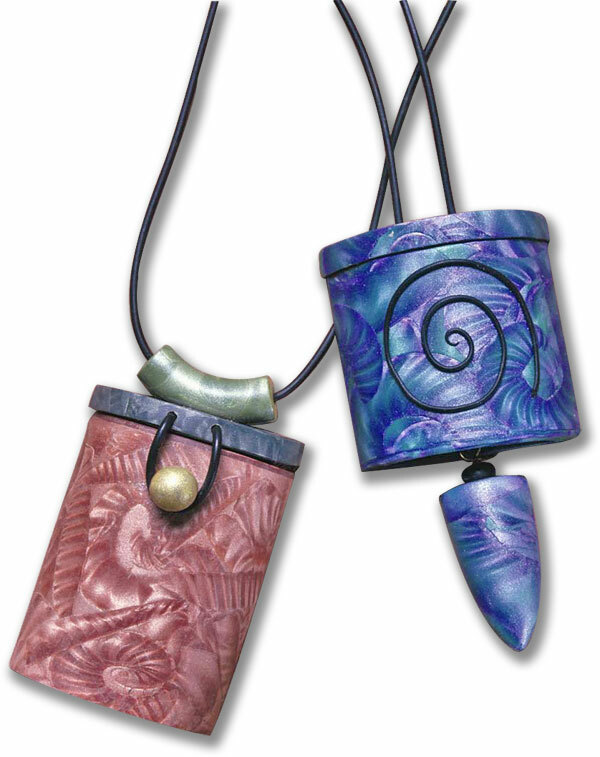 We end a busy week with busy polymer clay artist, Donna Kato and these lovely pieces from her latest book. Donna’s dexterity is a wonder and the ease with which she assembles these flawless inro constructions is remarkable. Donna has some updated information about photo transfer papers (some formulations have changed) on her site along with a raft of pictures from her teaching travels around the world. If you’re planning ahead for classes, save space on your calendar for Donna’s October 2008 cruise that departs from Tampa with a boatload of polymer clay teachers and a full roster of classes. I demo’ed Donna Kato’s opal technique at Klay Karma, only to be told by someone there that the Arnold Grummer iridescent flakes used in the technique are being discontinued. I went to the Arnold Grummer web site and there is no indication there that this is happening, but just in case, I ordered a few bags to stockpile. (Michael’s in Nashua is out, I do know that.) Just a heads up for those who really like the technique!